Freeform, Disney's young adult television and streaming network, continues to grow its roster of original series by ordering scripted comedy College-Ish (working title), a spin-off of ABC's award-winning hit series Black-ish, starring breakout star Yara Shahidi as Zoey Johnson and Deon Cole as Charlie Telphy. Freeform has ordered 13 episodes of the half-hour, single-camera comedy which is set to premiere early 2018 on Freeform and the Freeform App available on connected TV, mobile devices and online. College-ish follows the Johnson's eldest daughter Zoey (Yara Shahidi) as she heads off to college and quickly discovers that not everything goes her way once she leaves the nest. From "black-ish" executive producer Kenya Barris comes a contemporary take on the current issues facing both students and administrators in the world of higher education. Yara is joined by Black-ish's Deon Cole (Charlie), who moonlights as an adjunct marketing professor, as well as funny new characters both in the administration and student body who all reflect the complex and hilarious points of views that populate college campuses. Here's what Kenya Barris had to say about the spin-off in a statement. "I never thought they'd let me put Black-ish on the air let alone give me a spin-off. I couldn't be more excited for the opportunity to continue working with Yara and the rest of this talented young cast. To any aspiring writers struggling to make it out there, I highly advise adding an '-ish' to any working title you might have. It seems to be the move." Kenya Barris, Anthony Anderson, Laurence Fishburne, Helen Sugland and Brian Dobbins are executive producers of the series, from ABC Studios. The show was written by Kenya Barris and Larry Wilmore. Here's what Karey Burke, Freeform's executive vice president, Programming & Development, had to say in a statement. "Our goal at Freeform is to celebrate the power, possibility and inclusivity of youth culture through our shows. 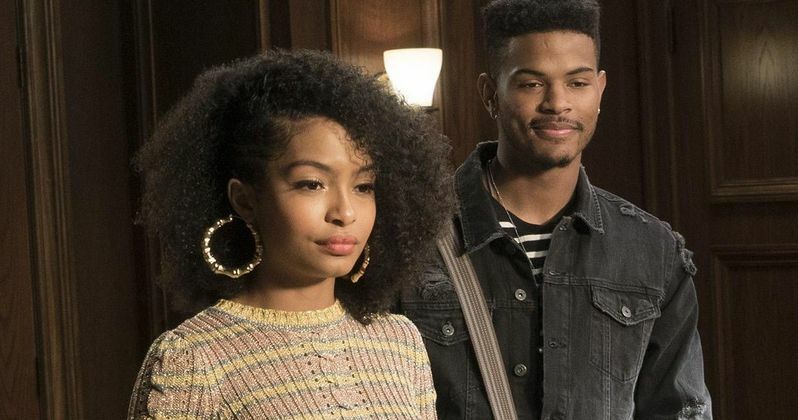 Kenya Barris blazes new trails in the funniest way possible with College-ish and we can't wait to get schooled by the incredibly talented Yara Shahidi, who is the perfect addition to our Freeform family." This spin-off was spawned through the second to last episode of Black-ish Season 3, a backdoor pilot episode entitled "Liberal Arts," where Zoey visits the University of Southern California for a two-day orientation program. She finds out when she gets there that her father Andre (Anthony Anderson) never turned in her housing application form. She sets up a meeting with President Schlock (Matt Walsh) and Dean Parker (Chris Parnell) to fix her housing snafu, which nearly results in the closing of the historically all-black dorm on campus. By the end of the weekend, with help of her new friends such as fellow incoming freshman Miriam (Mallory Sparks) and Aaron (Trevor Jackson), who lives in the historically all-black dorm on campus that almost got shut down, Zoey ends up landing a coveted student administration position, which will be waiting for her when she enrolls for school in the fall, which will likely be where the spin-off picks up from. Hopefully we'll hear more on College-ish soon.